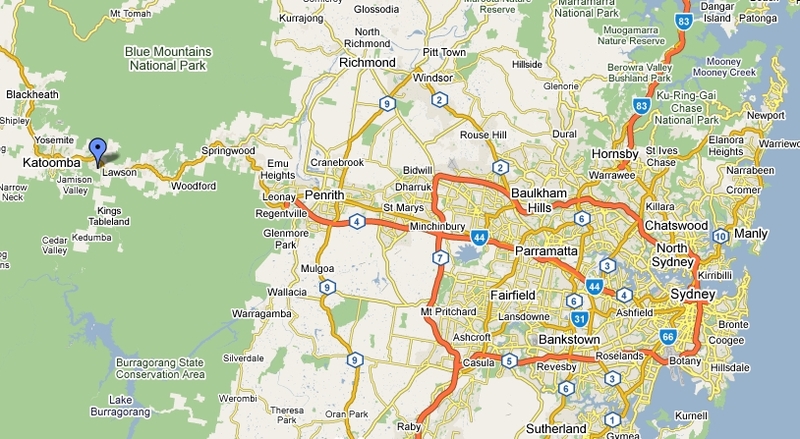 From inner Sydney: Make for for the M4 At Concord, then straight though to the Great Western Highway, and you're there. From the Northern Beaches: Aim at the M7, turn right onto the M4 at the Lighthorse interchange, (Penrith and Blue Mountains sign). onto the M4 connect to the Great Western Highway at the Nepean river. From the southern part of Sydney: Make your way to the M5 , connect to the M7 at Liverpool , turn left at the Lighthorse interchange (Penrith and Blue Mountains sign) onto the M4 connect to the Great Western Highway at Leonay and follow your nose to Wentworth Falls. If your coming up from Wagga, or the Riverina take the Olympic Highway to Cowra, pick the Mid Western Highway, head for Bathurst join the Great Western Highway and follow it east to Wentworth Falls. If you are comign in from Moree , it's due south on the Newell Highway to Coonabarabran, then on to Mudgee through Binnaway , Dunedoo and Gulgong, then head for Lithgow to pick up the Great Western Highway turn left and your nearly there. From Sydney: When you hit the Wentworth Falls town sign at the top of Boddington Hill. Drive into the village . Turn left at the second set of traffic lights into Falls Road. Follow Falls Road until you reach Fletcher St. Turn left . 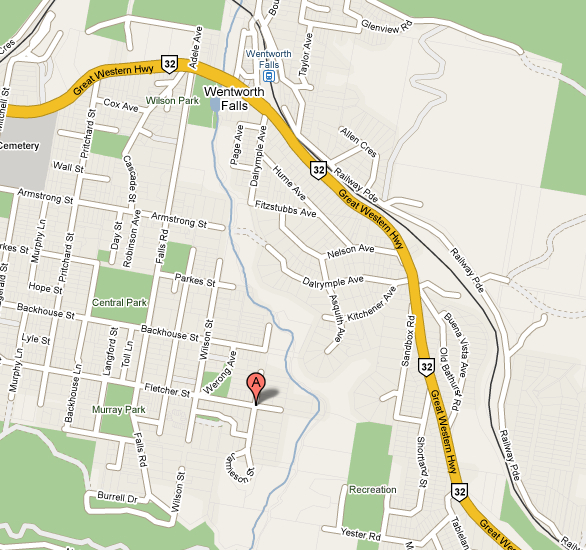 Straight down the hill and you've arrived in Jamieson St.
From the West: When you arrive at the Wentworth Falls town sign after Leura, turn right at the second set of traffic lights into Falls Road. Follow Falls Road until you reach Fletcher St. Turn left. Straight down the hill and you've arrived in Jamieson St.